One of the perks of traveling around the world for my adventure travel column is the chance to meet so many fascinating people, both locals and industry colleagues. In December of 2005, on a trip to Antigua, I ran into a fellow travel writer named Avital Binshtock, a California native who’s written for various magazines and newspapers (including the Los Angeles Times), and we’ve kept in periodic touch since then. I’ve known for some time that Avital was working on a guidebook about the California Wine Country, but I was still floored when a review copy of the finished product landed on my desk a few weeks ago. Here, at last, was a truly useful guidebook to Wine Country—something far harder to find than you might think. I asked Avital to answer a few questions about what went into writing the book, and offer a few tips for SmarterTravel.com readers. What follows is a transcript of the interview. Q: What sets your new California Wine Country guidebook, Frommer’s Napa & Sonoma Day by Day, apart from others on the shelf next to it? A: Most other guidebooks overwhelm with too many options presented either alphabetically or geographically. They neglect to tell me how I, with my specific interests, should travel. I tried to differentiate my book by distilling options and activities into organized, relevant itineraries geared toward specific types of travelers. One is for families with kids. Another is for arts aficionados. Another is for people with only one day to spend in Napa. Another is for couples seeking romance. There’s one for travelers on a budget, travelers who like to splurge, one for nondrinkers—and many others. Everyone’s sure to find their specific agenda. I also included walking tours of every charming town, a biking tour, a hiking tour, thorough listings of hotels and wineries, even a chapter about San Francisco. Q: Although you’re an accomplished freelance travel writer, this was your first guidebook. Tell me a little about the experience. Was it what you expected? What was the biggest reward? A: I don’t think I went into it with any set expectations other than it would be a lot of work and a lot of fun—and it was definitely both. Surveying such a region in such deep detail required dedication and love. But it also required a lot of time alone in front of the computer screen, getting everything down in a coherent and useful way with a deadline steadily approaching. That was probably the biggest challenge. I’m fortunate, though, that writing is one of my greatest loves. So the challenge is a good challenge, and it’s a blessing to be able to do what I love every day. The biggest reward … Wow, how can I pick just one? There are so many. The knowledge that I’m helping to make people’s happy times a bit happier is extremely gratifying. I also like knowing that I’m helping worthy entrepreneurs by promoting their ventures. My ego likes it when I’m called an “expert,” since I don’t know that I’ve ever been called that before. Getting to spend so much time in such a gorgeous part of the world was phenomenally fulfilling. Paychecks are nice, too. But I guess if I did have to pick just one, I’d say the biggest reward was seeing the faces of my family and friends as I handed them my first book. Their pride in me and support of me is more satisfying than anything else. Q: You’re a California native, so you were already somewhat familiar with the region. But what, if anything, did you learn about Napa and Sonoma over the course of your research that surprised you? A: Great question! Many things surprised me even though I’m a through-and-through Californian. I didn’t know that you could go on an African-style safari in Wine Country (at Safari West Wildlife Preserve). I didn’t know that Calistoga has one of the world’s three Old Faithful geysers. I didn’t know that Sonoma Plaza was California’s birthplace. Or that mustard is so central to Wine Country’s spring event schedule. Or that Martha Stewart shops at Oakville Grocery. Or that there’s an entire museum devoted to Snoopy. Or that a hot mud bath could feel so good. Q: Researching all of the different wineries for this book must have had its perks. What was your favorite experience along the way? A: Oh, it did have its perks. But my introduction to Wine Country was years ago when a boyfriend took me to Sonoma for my birthday. That first trip has always been my favorite Wine Country experience. He rented a tandem bike and we rode from winery to winery until we couldn’t even ride anymore. We picnicked on hills overlooking the stunning scenery, strolled Sonoma Plaza hand in hand, dined at an utterly romantic restaurant called The General’s Daughter and just enjoyed each other’s company. I didn’t know it then, but all that was in fact research; I used that trip as the model for my book’s “Wine Country for Romance” itinerary. 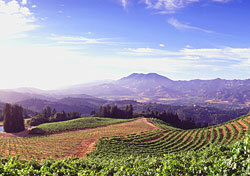 Q: Is there any advice for planning a wine country getaway that you’d like to share with SmarterTravel’s readers? A: Certainly. I would say: Know thyself. Ask yourself, what kind of traveler are you? Are you the type who’d be perfectly happy jumping from tasting room to tasting room, or would that bore you? Do you prefer to stay in a chichi town where everything is luxurious (try Yountville), or do you prefer a more woodsy ambiance (like Guerneville)? Are you a saver or a big spender? What activities do you seek? Shopping? Hiking? Kayaking? Spa-ing? Art gazing? Star gazing? Plan for what you live for. A trip to Wine Country, like everything else, is entirely what you make of it. Cater it to your interests and of course it will be interesting. Don’t confine yourself into thinking that the sole purpose of visiting is wine—unless that’s your sole interest. With the amount of activities available in Wine Country, the scope of your experience could expand (or shrink) in accordance with your goals for the trip. And once you’re there, remember that Wine Country isn’t necessarily about having one or two stand-out exhilarations. It’s more about experiencing—savoring—each moment as it goes by.